A rundown of methods for releasing drugs into the eye. Prior to the adoption of intravitreal injections for the treatment of retinal diseases, options were limited. Wet age-related macular degeneration (AMD), diabetic macular edema (DME), and retinal vein occlusions (RVOs) were all treated with laser photocoagulation as first-line therapy. • Intravitreal injection revolutionized posterior segment treatments by delivering drug directly to the site of disease. • Because intravitreal implants release low doses of drug directly into the vitreous cavity over an extended period of time, they reduce systemic complications. • Future options in controlled delivery of ocular pharmaceuticals will continue to improve patient outcomes and reduce treatment burden. The Macular Photocoagulation Study advocated laser treatment for wet AMD, which results in a dense scotoma in the area of the active neovascular tissue. The thinking at the time, however, was that it was better to cause a finite scotoma than to leave the disease untreated. Laser was a difficult treatment to recommend. I had to advise patients that wiping out a good portion of their central vision was better than not treating their disease and allowing it to advance. Most of these patients remember only that I caused their vision loss with a laser. Despite the treatments, these patients’ vision did not improve. The first generation of intravitreal pharmacologic therapy, using direct intravitreal bolus injection, has demonstrated that this platform is both highly effective and safe. Now the dawning of a new era in intravitreal drug therapy has begun: that of controlled delivery of pharmaceuticals, which includes sustained-release platforms and implantable eluting devices. Still to come are therapies based on nanotechnology and other platforms that promise to further improve drug delivery to the posterior segment. 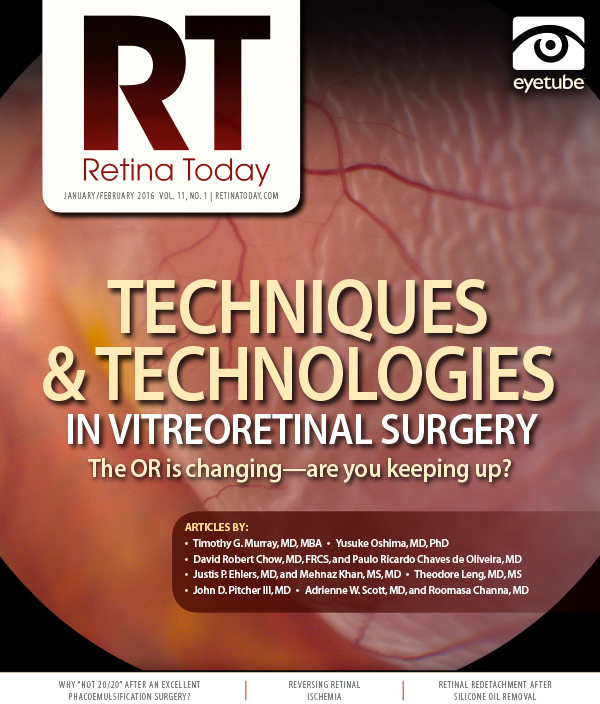 This article reviews some of the methods of delivery currently available that have changed the way retina specialists practice. One of the first alternative methods of drug delivery to the retina to become available was photodynamic therapy (PDT). Verteporfin for injection (Visudyne, Bausch + Lomb), approved by the US Food and Drug Administration (FDA) in 2000, is a light-activated drug used in PDT. It is indicated for the treatment of predominantly classic subfoveal choroidal neovascularization. Once approved, it was quickly recognized as a more viable option than traditional laser photocoagulation for treatment of wet AMD. Although patients often improve after treatment, the preparation and application of the procedure is extremely labor intensive, and patients have to avoid sunlight for 3 days after treatment. For these reasons, and because of its narrow indications and the subsequent advent of intravitreal anti-VEGF injections, PDT plays a limited role in AMD therapy today. Intravitreal injection of a drug better enables the treatment to reach the retina and reduces systemic toxicities. This mode of delivery has also given older drugs, such as steroids, the potential to treat diseases in new ways. For many retina specialists, intravitreal delivery of anti-VEGF drugs has become first-line treatment for wet AMD, RVO, and DME. Today’s clinicians have multiple anti-VEGF options available for intravitreal injection to treat a variety of posterior segment diseases. The most frequently used of these are ranibizumab (Lucentis, Genentech), bevacizumab (Avastin, Genentech), and aflibercept (Eylea, Regneron). With experience now in millions of injections, treatment with these intravitreal anti-VEGF agents has been shown to be safe and effective. Pegaptanib sodium injection (Macugen, Bausch + Lomb) was the first intravitreal anti-VEGF agent introduced for the treatment of wet AMD. It was also essentially the first intravitreally injected drug to gain momentum, and it demonstrated that this delivery method was more than just a theoretic possibility. Approved by the FDA for the treatment of AMD in 2004, pegaptanib offered an efficient and efficacious way to treat patients with wet AMD. In an office setting, patients received an injection directly into the vitreous cavity through the pars plana. It was an easy, cost-effective, and efficient way to improve patient care, and for the first time a therapy was available that could maintain visual acuity levels in some patients. Due to manufacturing issues, pegaptanib is no longer available in the United States. The FDA approved ranibizumab for the treatment of wet AMD in 2006, RVOs in 2010, DME in 2012, and diabetic retinopathy in the presence of DME in 2015. In 2004, the FDA approved bevacizumab for the treatment of colorectal cancer. It is currently used off label in the treatment of neovascular eye diseases. The most recent anti-VEGF agent available commercially, aflibercept was approved by the FDA for the treatment of wet AMD in 2011, DME in 2014, and diabetic retinopathy in the presence of DME in 2015. Parallel with the acceptance of intravitreal bolus injection as a safe and effective way of delivering drugs into the eye, several intravitreal implants have also found success. These devices are surgically implanted or injected directly into the vitreous, thereby allowing drugs to cross the blood-brain barrier and delivering direct, targeted treatment to the retina. Clinical results with these devices have been positive. Sustained-release therapy has significant clinical and economic implications. It enables continuous treatment with excellent outcomes, fewer office visits, reduced treatment burden, socioeconomic savings, improved access to health care, and improvement in compliance. The first intravitreal implant, the ganciclovir implant (Vitrasert, Bausch + Lomb), was approved by the FDA for the treatment of cytomegalovirus (CMV) retinitis in AIDS patients in 1996. It consisted of a 4.5-mg pellet of ganciclovir coated in a laminated system of biocompatible polymers. This mode of delivery reduced morbidity from systemic use of ganciclovir and immunosuppressive drugs (eg, steroids) while alleviating the patient’s eye disease. The implant has recently been discontinued. The dexamethasone intravitreal implant 0.7 mg (Ozurdex, Allergan) is indicated for the treatment of macular edema secondary to RVO, noninfectious posterior uveitis, and DME. Each implant releases dexamethasone for roughly 4 months. In 2005, the FDA approved the fluocinolone acetonide implant 0.59 mg (Retisert, Bausch + Lomb) for the treatment of chronic noninfectious posterior uveitis. According to the company, it delivers corticosteroid therapy for roughly 2.5 years. The fluocinolone acetonide implant 0.19 mg (Iluvien, Alimera Sciences) was approved in 2014 for the treatment of DME in patients who are not steroid responders (ie, those who did not experience a significant elevation of intraocular pressure in response to a previous course of steroid treatment). It releases fluocinolone acetonide for up to 36 months. These implants are among the first intravitreal devices to carry and release a drug over an extended period of time. Because they directly target the vitreous cavity and retina, systemic complications may be avoided. In the case of posterior uveitis, patients can avoid systemic immunosuppression and the morbidity of related infections. In the case of CMV retinitis, not only were more frequent intraocular injections avoided, but hematologic and systemic side effects were minimized as well. Intravitreal implants have shown that crossing the blood-brain barrier with a drug is possible, while at the same time reducing systemic toxicity and enabling treatments to better reach the retina. The availability of intravitreal modes of drug therapy has allowed us to improve treatments for many posterior segment diseases. Their adoption into our treatment protocols has allowed us to realize the advantages of crossing the blood-brain barrier. In the past 10 years alone, we have made huge strides in the ways we treat retinal diseases. 1. Campbell RJ, Bronskill SE, Bell CM, et al. Rapid expansion of intravitreal drug injection procedures, 2000 to 2008: a population-based analysis. Arch Ophthalmol. 2010;128(3):359-362. • retina specialist at Dressler Ophthalmology Associates PLC in Fairfax, Va.